Did you or someone you know reach out to 211 Maine and find the services or supports you needed? We are collecting success stories to add to our outreach materials (Facebook posts, website, etc.). We want to know if the information and referrals you received from 211 Maine really made a difference. Please share your success with us! * 2. 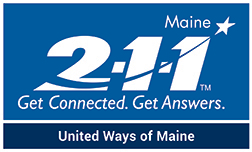 How did you contact 211 Maine? If you called or texted, how did the Specialist make you feel? * 3. Was the information you received from 211 Maine useful? * 4. Would you recommend 211 Maine to others? * 6. Do you give us permission to publish your story as long as no contact details are included? * 8. How did you hear about 211 Maine? * 9. Are you willing to share a photo to go with your story? If so, be sure to complete Question 10 and include your contact information. You will be contacted by a representative of 211 Maine.